Hymn to the Sun presents some of the most prominent Danish 20th- and 21st-century composers of choral music in works using a modern, variegated musical language that draws inspiration from many different genres and styles. More than anything else, this is music inspired by highly evocative texts: Poems by Hans Christian Andersen; the Psalms of the Bible, and ancient poetry worshipping the Sun. 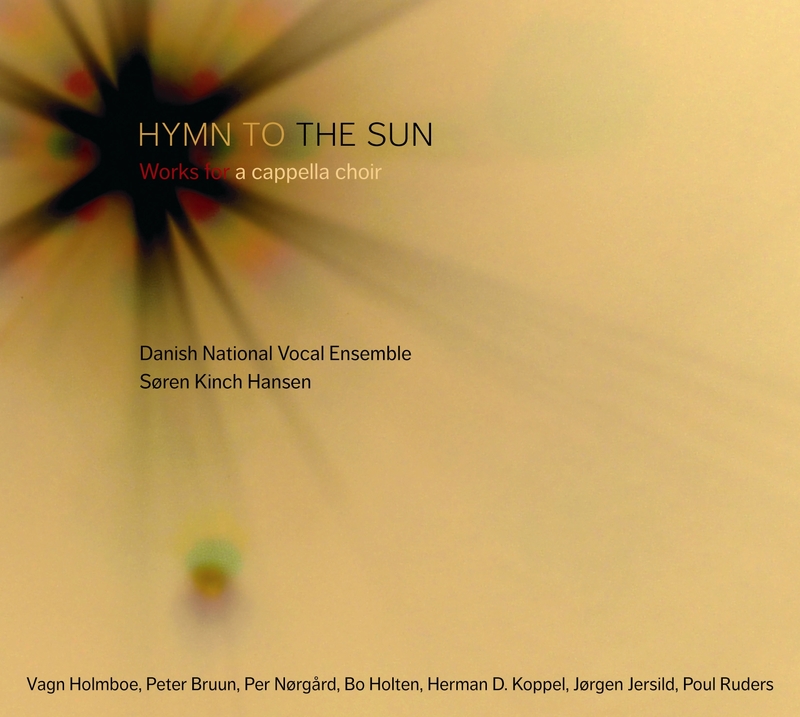 Hymn to the Sun is the debut CD of the Danish National Vocal Ensemble. "Et homogent og velsammensunget ensemble, med en forbilledlig tekstudtale." "Mirado con distancia, este disco es fruto de la tradición coral danesa, una de las más potentes de toda Europa." "Les chemins parcourus tracent la carte d'une modenité subtilement tempérée à l'image des faisceaux de lumière qui traversent une belle matière chantée et parfois parlée dans la pièce de Vagn Holmboe." I Tempo giusto 4:12 6,40 kr. II Parlando 3:08 6,40 kr. III Tempo giusto 5:20 9,60 kr. Forårssang (Spring Song) (2000) 4:38 6,40 kr. Vandring i Skoven (A Walk in the Forest) (2000) 3:27 6,40 kr. I Lysets fædreland (The Native Land of Light) 2:52 6,40 kr. II Løft mig kun bort (Come Lift Me Up) 2:06 6,40 kr. Ps. 23: Herren er min hyrde (The Lord is my Shepherd) 5:43 9,60 kr. No. 1 Herre, din miskundhed rækker til Himlen (Thy mercy, O Lord, is in the heavens) 2:11 6,40 kr. No. 2 Herre, min Gud, jeg råber om dagen (O Lord God of my salvation) 2:15 6,40 kr. No. 3 Kom, lad os juble for Herren (O come, let us sing unto the Lord) 1:43 6,40 kr. Il cantico delle creature (1991) 6:33 9,60 kr. I Preghiera semplice (1981) 5:10 9,60 kr. II Caritas Nunquam Excidit (1988) 3:38 6,40 kr. III Psalm 86, Herr, Neyge deine Ohren (1985) 6:24 9,60 kr. “There is a wondrous land, its name is Poetry!”. So begins Hans Christian Ander-sen’s poem “The Native Land of Light” and immediately you imagine Poetry as a landscape of images, words, colours, moods and music, not a land you can capture in a description or depict precisely, but one you can know through sentences, images, music. The combination of words, colours and notes that make up something different and greater; which creates a meaning beyond these elements themselves so that you experience the world anew; a country, a mix of spices, or what Per Nørgård bakes in his Musical Fanta-sy Oven – the composer’s own name for the space in which his two works on this CD were created, in an encounter between Hans Christian Andersen’s words and the music where they are fused into one. Vocal music is tone painting par excellence. When text and music are joined, they create moods and images. For the composer who wishes to set a text to music, the music – in Nørgård’s words – springs from the words, and when you sing or listen to a song, you often feel that the music is expressing what the text says. But it is precisely the combination of these very words and notes that is crucial to the mood you experience, or the associations you get when you hear the song. The meaning of the text is underscored in the music either as tone-painting or indirectly through contrasts and symbolism. By combining words with music you can make an atmosphere grow out of the words; one that would not necessarily be felt if the words were only read out as a poem or a text. Hymn to the Sun is the Danish National -Vocal Ensemble’s first CD, and the composers represented on it are a selection of the most prominent Danish composers of choral music in the 20th and 21st centuries; some because they write almost exclusively for choirs, others because their choral works have become classics that are performed again and again by both professional and amateur choirs. The composers are from a culture with a strong tradition of choral singing, both sacred and secular as well as widely known songs, that reaches far back into the past. This has created a flourishing choral tradition with a wealth of chamber choirs, children’s and youth choirs, concerts, choir festivals and competitions. Old folk songs as well as more recent Danish songs, for example by Carl Nielsen, Oluf Ring and Otto Mortensen, arranged for mixed choir or equal voices, are part of the core repertoire of many choirs and make up the more popular part of the Danish choral litera-ture. Another part is the art music within which there is a growing repertoire of choral works; and it is to this branch of music that the seven composers on Hymn to the Sun belong. Their works exhibit great differences, yet they all have the common feature that they have been written in a modern, variegated musical language that does not stick to any one style but draws inspiration from many different genres and styles. The questioning of tradition, the breakdown of sharp distinctions between styles and genres, and openness to inspiration and influences from the artistic and musical cultures of the whole world, are some of the characteristics of the artistic spectrum of the 20th and 21st centuries, and the works on this CD are part of this spectrum. Textually, the works fall into three different types: some are settings of poems by Hans Christian Andersen, others of texts from the Psalms of the Bible, while a third group has texts that pay homage to the Sun, including Vagn Holmboe’s Hymn to the Sun, which has also given its name to the CD. Andersen’s poetic language is imaginative, picturesque and poetic, while the Psalms of David praise and worship God. The two hymns to the Sun lie somewhere in between, as the homage to the Sun expressed in the texts is expressed in clear images and narratives. Vagn Holmboe had a great influence on -Danish and Nordic musical life through his activities both as a teacher and as a composer. Many people consider him the greatest Danish symphonist after Carl Nielsen, and he is in fact best known for his symphonies, quartets and chamber concertos. But his large output of choral works also enjoys much attention. Each year in March his native city Horsens pays tribute to him with the festival “Holmboe in Horsens”, which has the composer’s music as the focal point. Hymn to the Sun is not the best known of his choral works – far more often, one hears the motet cycle Liber Canticorum, the three Hunters’ Songs, Haymaking by the Sea or the larger work for choir, soloists and orchestra Requiem for Nietzsche. As so often in Vagn Holmboe’s works, Hymn to the Sun develops organically from a simple point of departure and grows into a balanced whole, characterized by a clear, strong structure. In Hymn to the Sun the development reflects the rising of the sun on the horizon, and the music grows with the ascent of the sun, starting with a single note when the sun is only a glow on the horizon, and culminating when the sun appears in the sky. The text was written by the Pharaoh Akhnaton over 3000 years ago and pays homage to the Sun, the most important of all the gods in the ancient Egyptian religion. The text de-scribes the progress of the Sun from its rising to its setting and the new sunrise. The three stanzas thus describe a day, a night and a new daybreak, and while the choir sings powerfully and enthusiastically of the light and the power of the Sun by day, Holmboe lets the description of the darkness and the night alternate between chanting and song as an echo of voices from the darkness/the kingdom of death. The music is more diffuse and floats in and out, back and forward. When the Sun returns again in the third stanza, the music grows slowly, almost reverent-ly, and culminates in the sentence “Bright art Thou, Sun”. Spring Song by Peter Bruun begins a group of four works with texts by Hans Christian Andersen. The title is often used for both poems and songs, and in reality is simply an expression of a feeling: the urge to sing when the spring comes! The poem begins while the earth is still covered in snow, expressed in music with very lit-tle movement and almost static sounds, like a picture of the cold, clear landscape. But the static mood is broken and the music unfolds when the sun peeps out and the snow begins to melt as a sign of the coming of spring. Peter Bruun’s music is among other things melodious, direct, rhythmically varied and written in a recognizable tonal idiom. The constantly shifting time signatures bring life to the music, and in Spring Song the rhythmic character becomes a symbol of the overflowing joy of seeing the forest bursting into leaf and hearing the birds sing. Spring Song is a clear example of how words and music reinforce each other and evoke recognizable images and moods throughout the song. A Walk in the Forest is a love song where Hans Christian Andersen uses the forest and nature as images of love. The poem describes two lovers who go for a walk in the beech forest on a summer night, and the forest and the young bride merge together as a symbol of something living, present and life-affirming. A simple text, for which Peter Bruun has composed a simple melody and a setting that in places is almost ethereal, as an image of the mood of the light summer night. Note the little duet between tenor and soprano/contralto at the end of the piece; a duet between the two lovers. Peter Bruun is one of the Danish composers of his generation who has been enjoying most attention in recent years, not least because of his choral works, chamber music and music drama. He has collaborated with among others Figura Ensemble, the poet Ursula Andkjær Olsen, the stage director Ditte Bjerg and the stage designer Filippa Berglund. Besides composing, Peter Bruun frequently works as a communicator with children, for example in the projects ‘Small Composers’ and the ‘Small Composers Workshop’, where he composes with children and gives them the tools they need to make their own music. In 2008 he was awarded the Nordic Council’s Music Prize for the music drama Miki Alone. The Native Land of Light (original title: Poetry) was directly addressed by Andersen to the Romantic poet Adam Oehlenschläger, and is an evocation of the nature of poetry. The poem expresses Hans Christian Andersen’s wonder over what poetry is: it is in all things, it is eternal, it is elevated above the physical world, and it is experienced as almost divine. Per Nørgård’s music alternates between something dark and mystical and something glad, cheerful and enthusiastic as an expression of this feeling of both amazement and awe, but also of ebullient enthusiasm. Bear Me Away (original title: The poet’s last song) is a song to Death. The poet longs for death to come for him; he is serene about leaving what he loves and expectant about what will happen. While the musical formulation of his farewell is melancholy and yet hopeful, the flight of Death is dramatic, quivering, desperate – an intense journey that suddenly ends in a warm, open chord as a symbol of the poet’s belief that there is a life after death, and that this life is beautiful and enduring. Per Nørgård is unquestionably one of the most pace-setting Danish composers. The ground beneath his music is constantly shifting, and eternal searching and confrontations are characteristic of his artistic endeavours. In the 1960s and 1970s he explored his so-called ‘infinity series’; in the 1980s he took up the great existential issues with works inspired by the schizophrenic Swiss artist Adolf Wölfli; and in the 1990s he has experimented with the phenomenon he calls ‘tone lakes’ – all new ways of creating -musical expression. Per Nørgård has been a strong voice in the development of contemporary Danish music, not only through the originality of his own music, but also through the influence he had on the younger generations of Danish composers as a professor of composition at the Royal Academy of Music in Århus in the years 1987-1995. Nørgård’s work list is extensive and covers a broad spectrum from grand opera to simple choral songs, orchestral and chamber music, ballet music and much more. Psalm 23, The Lord is my shepherd, is one of the Biblical psalms that has most often been set to music – possibly because of its painterly imagery with green pastures, still waters and the valley of the shadow; in its way an optimistic text saying that no evil can assail someone whose faith is firm and who has the Lord as shepherd and protector. Bo Holten expresses this lightness and undauntedness with a simple opening motif that is repeated, and which is sung as a kind of canon, evoking an image of all the faithful of the Lord adoring and praising Him. Along the way the music changes character with the text – sometimes the words are directly illustrated in tone paintings, as with the phrase “My cup runneth over”, which is rendered musically in a kind of stretto of fast-moving elements suggesting how the content of the cup overflows. For many years Bo Holten has been a central figure in Danish choral music. He founded two professional vocal ensembles, Ars Nova Copenhagen and Musica Ficta; he has com-posed a large number of choral works and has arranged many Danish songs for mixed choir and equal voices. For Bo Holten the process of musical composition is always part of a specific musical practice, and his music is outward-looking and direct. Danish songs in Bo Holten’s arrangements are in the repertoires of many choirs, since they are incredibly singable and easy to work with for both amateur and professional choirs. He is furthermore considered one of the world’s best choir conductors, and abroad he has worked with among others the BBC Singers and the Flemish Radio Choir. Herman D. Koppel’s work, too, uses texts from the Psalms and consists of three short set-tings. The first takes its text from Psalm 36, Thy mercy, O Lord, is in the heavens, and here the composer describes the Lord with great, slow-moving sounds as a symbol of the eternal, the enduring. Mankind, on the other hand, is depicted with a mobile, agitated, bantering melody as an expression of the clear contrast between the earthly and the divine. The second piece sets Psalm 88, O Lord God of my salvation, and is a lamenting piece expressing mankind’s cry to the Lord. It ends in a major chord – perhaps suggesting that the cry has been heard. The third psalm is energetic, jubilant, almost bordering on the shrill, and much of it consists of parallel motion. The text is from Psalm 95, O come, let us sing unto the Lord. Herman D. Koppel was one of the greatest Danish musical personalities of the twentieth century. He made his debut as a pianist in 1930, but already before this his first works had been performed. As a composer Herman D. Koppel was more or less self-taught, inspired by among others Carl Nielsen, Bartók and Stravinsky, but jazz and world music also influ-enced him when he was a young man. He composed industriously in all forms and genres and wrote a long succession of strik-ing, clear works. Among his major works are seven symphonies and several solo concertos, sonatas, chamber music, piano works and many vocal works. He also wrote film music, educational pieces and cabaret songs. Consisting of almost 300 works in all, characterized by vital rhythms and strong melody lines, Herman D. Koppel’s music makes an immediate impression as well as providing matter for reflection. The second sun hymn is St. Francis of Assisi’s Il cantico delle creature (The Song of the Creation), which in Johannes Jørgensen’s Danish translation was given the name Solsangen – the Sun Song. The text is a panegyric on all that God has created: nature, the elements – all that vitalizes the life of man. Whereas the Egyptian Hymn to the Sun describes the course of the Sun, this Sun Song speaks of the sun, the moon, the wind and fire. Jørgen Jersild has given each element its own musical character: the melody for ‘Brother Sun’ is powerful and grows like the Sun, which rises up unlike ‘Sister Moon’, who is sung piano and only by women’s voices. ‘Brother Wind’ is more stirring, airy and keen, while ‘Sister Water’ is sung by a soloist – here the human voice is equated with pure, clear water. ‘Brother Fire’ is depicted in quick motion and grow-ing like fire, while the praises of ‘Mother Earth’ are sung by a tenor soloist. The list of Jørgen Jersild’s works is not long, but his four works for choir have all become choral classics. Besides his work as a composer Jørgen Jersild was well known as an able teacher who published a number of much-used textbooks. Over the past 15-20 years Poul Ruders had experienced a constantly growing interest in his music, not least abroad. He has com-posed commissions from a number of the most im-portant orchestras and musicians of his time, including solo concertos for -Heinrich Schiff, Yuri Bashmet and Rolf Hind. Poul Ruders has written a large number of orchestral works and many solo concertos as well as various chamber works. His first opera, from 2000, The Handmaid’s Tale, was a great success both in Denmark and abroad, and since then he has written a further two operas, Proces Kafka (Kafka’s Trial) and Dancer in the Dark. Poul Ruders’ Three Motets have been written for three different texts: one about peace, Lord, Make Me an Instrument of Thy Peace, said to have been written by St. Francis of Assisi; a text from the Old Testament; and yet another of the Psalms of David, Psalm 86. Each of the three motets can stand by itself. The first motet starts monophonically with a melody of a Gregorian character which lat-er unfolds into polyphony and -alternates back and forth between mono-phony and polyph-ony as well as in canon, as an emphasis on what humanity could do if it became the Lord’s instrument of peace. Dynamic contrasts illustrate the pairs of opposites in the text: ha-tred-love, doubt-faith, darkness-light, etc. The second part of the text is about all that man-kind must learn, which Poul Ruders illustrates with joyous, optimistic, rhythmic sequences. The motet ends forte and in a major key as a symbol of man’s rebirth to eternal life. The first part of the second motet has a much more dramatic, intense character, and the first section is sung by three male soloists. The second part is slower, more fluid and gloomy. A motet about the realization that love is the greatest power of all. The third motet is dedicated to Ars Nova Copenhagen. The text is sung in 15th-century German, and is set for six-part choir. Unlike the second motet, this piece develops slowly, and the many dissonances give it an almost bitonal character, underscored by the way the male and female voices often sing against each other as contrasts that drive the music forward while at the same time drawing apart.